Cops got your goat? Maybe. Photo courtesy of Seattle Animal Shelter. Jonah Spangenthal-Lee at the SPD Blotter reports that a South Precinct police officer found a lost animal while patrolling in Rainier View (not Beacon Hill) Sunday morning. 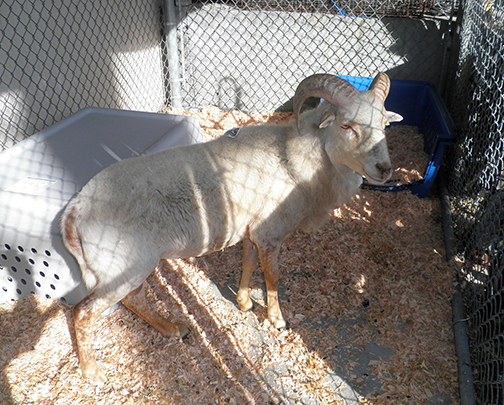 But this wasn’t the usual lost cat or dog — it was either a goat, or a big-horned sheep. (According to the Seattle Times, there is some uncertainty about the animal’s species at this point.) A full-sized male animal of about 60 pounds, the beast was just wandering down the street near Beacon Avenue South and South Leo Street. Police have turned the beast over to the Seattle Animal Shelter. If you know where he came from, you may want to call the Shelter to let them know: 206-386-7387.